The search for the underlying heritability ofcomplex traits has led to an explosion of data generation and analysis in the field of human genomics. With these technological advances, we have made some progress in the identification of genes and proteins associated with common, complex human diseases. Still, our understanding of the genetic architecture of complex traits remains limited and additional research is needed to illuminate the genetic and environmental factors important for the disease process, much of which will include looking at variation in DNA, RNA, protein, etc. in ameta-dimensional analysis framework. 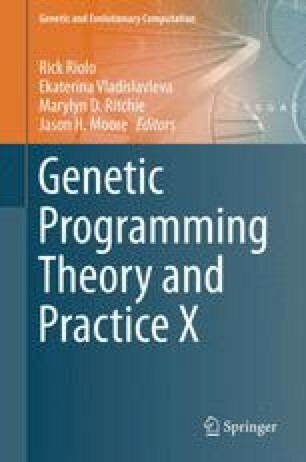 We have developed amachine learning technique, ATHENA: Analysis Tool for Heritable and Environmental Network Associations, to address this issue of integrating data from multiple “-omics” technologies to identify models that explain or predict the genetic architecture of complex traits. In this chapter, we discuss the challenges in handling meta-dimensional data usinggrammatical evolution neural networks (GENN) which are one modeling component ofATHENA, and a characterization of the models identified in simulation studies to explore the ability of GENN to build complex, meta-dimensional models. Challenges remain to further understand the evolutionary process for GENN, and an explanation of the simplicity of the models. This work highlights potential areas for extension and improvement of the GENN approach within ATHENA. ERH was supported by NIH/NIGMS training grant T32 GM080178. MDR was supported by NIH grants LM010040 and P-STAR. P-STAR (PGRN Statistical Analysis Resource) is supported by funding from NIGMS and is part of the PGRN (Pharmacogenomics Research Network). P-STAR is a component of HL065962.